Due to the intimate setting in our Salon we regret that we will no longer being accepting reservations for groups of 9 or more for a shared room. If you would like to book a private event in "Paris" we would be happy to have one of our Event-Tea Planners assist you in your reservation. Please call (714) 538-9411 to speak with of our planners. Please read below if you would like to preview a menu, pricing and policies before you consult with our event staff. We look forward to helping you show off your hostess savoir-faire. Your event will be handled personally by one of our large party specialists. Our beautifully appointed Grand Salon will be yours privately for up to three hours to enjoy with your guests. A personal serve-staff will be assigned to your event to see to your needs. A full Tea service of aromatic pots of tea served with freshly-baked warm scones with cream and jam, assorted tea sandwiches and petite savories, salad*, and petit fours. Iced tea, or lemonade or coffee can be substituted for hot tea upon request. *You may substitute soup for salad or you may add a soup course for an additional $5.00 per guest. 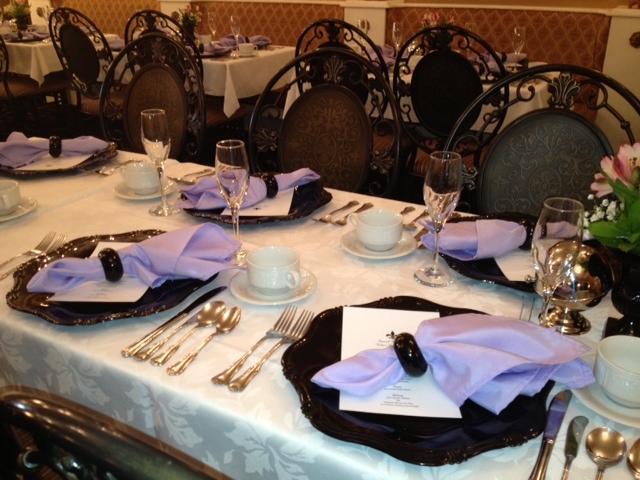 Table linens and chargers at each place setting. Cake/cupcake display, cutting and serving. Room is closed to the public. Up to three-hour reservation. Hostess and a helper may arrive up to½ hour before to set up at no additional cost. (Minus a $100.00 cancellation fee) Deposit is forfeited if cancellation is less than 15 days. *For parties of 30 or more, please add $45 per additional guest. Children are welcome and must be counted in your guest count in order to assure adequate seating. Please remember that strollers are not permitted in the salon and we do not have high chairs or booster seats. For safety children must remain seated during entire tea time. We are sorry, but we cannot accommodate children’s parties. All decorations must be confined to the table tops. No balloons, glitter or confetti, banners please. The above is a set menu. Our kitchen staff will try to accommodate any advance dietary requirements requested. We will not be able to honor any last minute menu changes. Reservation is for up to three hours. Parties going overtime will be subject to a $250.00 per quarter hour fee. We cannot box food to go at event teas. The above is subject to change at any time. Please call 714.538.9411 to speak with a large party booking specialists. The best time to call is before 11:00 AM or after 3:00 PM. We will be happy to check dates for availability and answer any questions you may have. Signing and deposit does require an in-person appointment, so we may go over the contract in detail with you and answer in questions you may have. 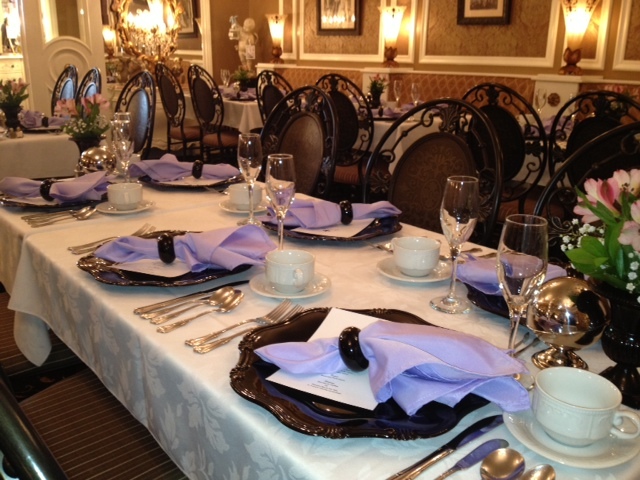 We look forward to assisting you in planning your very important event.